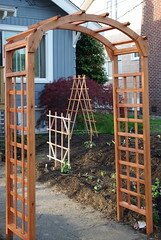 This entry was posted in Garden and tagged Garden, seeds, sprouts, trellis, viking topsoil by hollyo. Bookmark the permalink. Woo! It looks great! And my garden looks ever so much nicer through your camera lens than it does in real life.